Long story short, PBWiki is yer only man. I was chair of the it@cork Conference organising committee last year. The committee is made up of volunteers who are all busy with their day-to-day jobs so getting times to meet which suit everyone is always challenging. To help with the organisation I rolled out a private wiki where we posted meeting minutes, kept track of action items, posted to-do lists and updates on (potential) speaker status’. The wiki was a hosted PBWiki and it was a great success. be cheap or free (it@cork is a not-for-profit)! I searched around and discovered that Atlassian’s Confluence enterprise wiki product has a free community license specifically for not-for-profits. PBWiki, and SocialText didn’t have any mention of a free Enterprise class offering on their sites so I didn’t really pursue them. Boy was that a mistake! The setup of the Confluence wiki was far from straightforward. It took two of us the best part of a day to simply install it. Remember that as I was doing this for it@cork, this was not billable time. I was installing it on my own server and because Confluence requires TomCat as its webserver it had to run on a separate port to Apache. This meant several people couldn’t view it in their organisations. Worse though was that once it was successfully installed, it was a disaster. Uptake and use of the wiki was minimal because the UI was appalling. Editing groups doesn’t appear to be possible at all i.e if I want to remove 7 people from a group containing 25 people, I have to go into each user profile (using all the steps above) and remove them individually. It should be possible to do it in one simple step from within a Group Admin page. Other problems with Confluence included the fact that there are almost no stats around use of the wiki available and there is a bug in the users and groups which meant that the permissions applied to the groups were not percolating down to the members of those groups. A pretty serious bug I’m sure you will agree. I Twittered recently that I was looking to get off Confluence and onto another Enterprise wiki platform and within minutes Ross Mayfield, Chairman of SocialText had contacted me (despite being on vacation!) offering me a SocialText wiki for it@cork. Yes please I said (poor guy, I nearly bit his hand off!). The backend of SocialText is far cleaner, simpler and more intuitive than Confluence. However, for completeness sake I also contacted PBWiki and when they heard this was for it@cork, they immediately offered business edition wikis at no cost. This was spectacular news as it@cork were already familiar and happy with PBWiki. The PBWiki backend is the cleanest and simplest of the three (it is also the only one which fits vertically on a 1024×768 screen). Not only that but when you compare the edit screens of both SocialText and PBWiki, PBWiki definitely comes out ahead in usability. So we have a winner – PBWiki. What surprised me in this is that when I Twittered looking for an alternative to Confluence, not one person suggested PBWiki. I have no idea why this is. 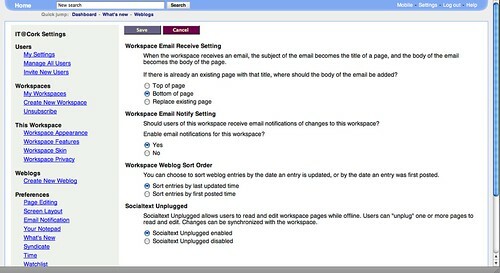 PBWiki has both Enterprise class functionality and a UI which is completely non-intimidatory. I predict no issues with uptake by users this time round. By the way, I did also try out DekiWiki and Twiki but I ruled them out quite early on. 1. I compared a non-hosted version of Confluence to hosted apps like PBWiki and SocialText. However, hosted Confluence is NOT available under the community license. As this was for a not-for-profit a community license was all we could go for. PBWiki and SocialText had no such restrictions. 2. I tried out DekiWiki but the lack of an ability to create Groups ruled it out quickly. 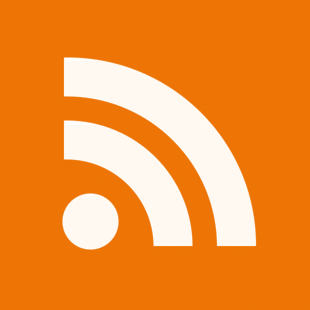 Audio player plugin not working in WordPress 2.5? I have played with DekiWiki and liked it. However, installing all the required software is non-trivial and not actually possible on my hosted server (Bluehost). The 30 second install (self-contained prebuilt VMWare image) is pretty neat though in an effort to overcome this. Thanks for the round-up. In work, we’re big users of Confluence – when selected 18 months ago, it had the WYSIWYG editing UI that was a must have (though a lot us frequent users ignore it and use the more powerful markup) and could hookup to external LDAP authentication etc. Some issues along the way – particularly performance – but works well. Will look into the other two next time we’re shopping for a revamp. Sorry you had a bad experience with Confluence. Most of our 4,500+ customers are very enthusiastic about Confluence’s enterprise capabilities, usability and APIs. That said, it’s not for everyone, and PBWiki is an excellent choice, too. we ran MediaWiki for over a year but I just find it clunky. MoinMoin is pretty good but a bit fiddly to install. SocialText Community Edition is a nightmare install due to all the Perl dependencies. We’ve used the free PBWiki for all the BarCamps. It’s fine but I’ve never been too enamored with its feature set and more importantly was forever getting “sorry can’t do X, try again later” from it. I’ve been playing with Google Sites for the past two weeks. Not bad at all. I think the hosted approach is definitely the way to go no matter what solution you pick. Now if only I could import all our MediaWiki content into a hosted solution! p.s. I think a simple mod_rewrite on Apache would take care of the 8080 problem on Confluence. I like PBwiki a lot, but for non-profits Wikispaces is cheaper and just as easy. It’s a little more basic, and not as attractive, but newbies like it. Sad to hear that you had a bad experience with Confluence Tom. The version that will be released this month is really targeted at making what we think is a good UI into a great one for the user. Thanks for listing through your frustrations with the Administration console, it is something we will be working hard on in the future. Good luck with PBWiki. 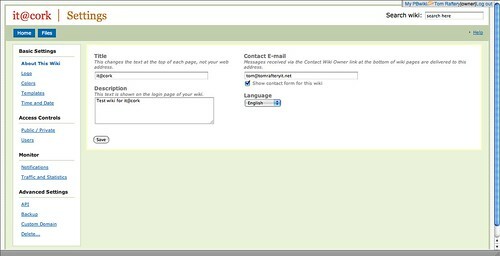 @Joan – wikispaces doesn’t allow for private wikis without updating to a paid account. @Conor – I haven’t had the â€œsorry canâ€™t do X, try again laterâ€ experience fortunately. If you haven’t seen it since the recent launch of their v2.0, I suggest you do. @Jon – when I contacted Jeff Walker about the UI issues in Confluence, he agreed that it needed work! @Adnan – Thanks for stopping by and commenting. I only listed two of my frustrations with the Administration console. 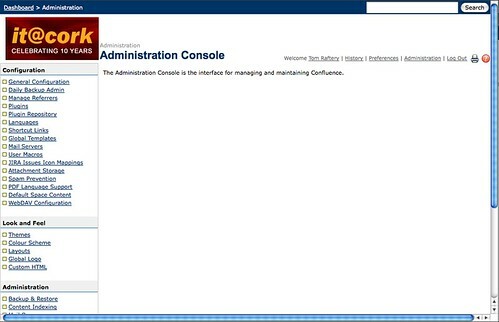 I have many, many frustrations with the Admin console. If I were to list them all the post would have gone on for far too long (it was getting to be too long already). We tried several wiki systems 3 years ago. MediaWiki came out to be the best one. It manages very badly multilingual situations, though. Right now, Google does also have a very good alternative. isn’t it refreshing though to see the comments of jon & adman? Crazy really that sane, adult responses to discussion/criticism of a product stand out so much… I’ve more or less come to expect defensive aggression these days…! I don’t have the technical skills to do it myself, but I have seen some pretty outstanding deployments of confluence. However they had some serious design interventions going on and I don’t know how difficult it was to tweak it all before launch. Strange you would not review MindTouch Deki Wiki. It’s likely more widely used than all these combined. I’m curious why you ruled it out early on. There is a free and ad-free hosted option of Deki Wiki available at http://wik.is. Also, http://mindtouch.com/Technology will give you some idea of how MindTouch is very different from any of the other offerings you’ve looked at. Aaron – I looked into DekiWiki and you’ll see in my point 2 in the update at the end of the post I ruled it out because of the inability to create groups for permissions. Oh! Thanks Tom. I just read that. Actually you do have groups in Deki Wiki. You can use both internal or external groups. Externally you can use LDAP, Active Directory, or even Drupal, WordPress and some other apps for exposing groups. MindTouch’s Deki Wiki is a distributed application platform that allows a site admin (presumably an IT person) hook in external apps, services, databases, auth systems, etc. Users can then organize data and systems in a manner most appropriate to them. In short, MindTouch connects teams, enterprise systems, Web2.0 apps and services. These external apps extend the platform and can be used by (even non-programmers) to create situational apps and data mashups. Hi! We’re really glad that you found and liked PBwiki. There are obviously a lot of choices out there, particularly for behind-the-firewall installs. We face tough competition from very clever and professional people (some of whom have commented in this thread), so it’s incredibly helpful for us to know what features are most important to you – knowing where you found PBwiki strong helps make sure we can emphasize those things going forward. (Of course, knowing what’s not working for people is equally important!) Thanks again for your consideration of PBwiki. You discounted Twiki but didn’t elaborate on why – just wondering what did you not like about it? Bill, the main reason for discounting Twiki was that after our experience with Confluence we wanted a hosted solution. The PBWiki hosted solution was familiar to us and cheaper than the hosted Twiki alternative (twiki.net). No other reason than that tbh. I fully share your frustrations with Confluence, but I think it is still one of the best on the market. PBWiki is pretty good too. If you did not need groups I would say that you should try Nuospace (http://www.nuospace.com), we are planning to add the groups feature later this year. Thanks for the reply on that Tom. We use PB Wiki and love it but we also explored WetPaint and didn’t mind that either. It’s nice that it is fully customizable to mimic the design of a blog or website. Check out our wiki in the Resources section! We’ve been using Confluence for about two years now and it’s going great. This is not to say that is not without its issues, and you have addressed them very well here, but overall, I think if you had a bit more time perhaps, from a systems & services management point of view I fell it is quite excellent (not withstanding silly UI issues). We have found that Confluence works best when users are managed though Active Directory, eDirectory or Open LDAP, i.e. any directory service etc and allows (in the case of eDirectory anyhow) us to manage group permissions on the fly using dynamic groups. Don’t bother using its own user db, its too much hassle and I don’t want yet another web admin interface to add more users and try and sync accounts, its too messy. But Confluence is aimed at the Enterprise market more so than other WIKI software and I think its fair to assume that most enterprises will have some type of directory service somewhere. Take up was slow, and in fact has not been a 100% or near, but I think a lot of that has to do with our dislike of writing things down and not having a sharing and caring mentality rather than the software even withs its weird UI. I am beginning to form the opinion that confluence is probably best as a developer tool, given its close integration with Jira. That being said it can perform quite well as an enterprise wiki. Finally, another wiki/collab software, and one to watch out for, is Jive Software Clearspace (They also produce an excellent Jabber server)… if only Confluence had some of its features and vice versa, I am sure you would have been happy. Best of luck in Spain. I 1000% agree with Tom regarding the problems with Confluence. I have no clue why they made the architecture so complicated and so unintuitive. Possible reason could be “Business” with “Open Source Tag”. I hear they are making lot of money, but I dont find much of interest to work with that. The Team is so much distributed — I felt Atlassian is not a company but a million sub-companies taking their shares on the name of “OPEN SOURCE” “FREE” tags all the way. I think they should come up with more professional commercial wiki solution than what they are today. I see least commitment. Their forums – Horrible. No replies. Its back end is bad…I tried linking it to MySql, it doesnot scale up at all. They dont help either, but they demand upfront. I need to try out PBWiki. I liked simple PmWiki and PhpWiki. Currenly I am developing my own wiki for my needs. The open source solutions, such as those offered by our webhost, are clunky and way over the top. Way to many functions and not user friendly for reducing learning curves for new users. Others, such as Twiki and DekiWiki were “intense” to install…it would take me days to complete it, and then to manage all the upgrades to servers, databases etc. There really wasn’t a good option. Looked at http://www.pbwiki.com, http://www.brainkeeper.com, http://www.wetpaint.com, http://www.atlassian.com, http://www.wikispaces.com and http://www.centraldesktop.com. http://www.pbwiki.com: good function and easy to use, and I liked it. The problem that I ran into, is the storage space. The website states 10GB, but after signing up, they only really offer 10MB. The software is great, but 10MB of storage makes it useless. If you want more storage space…you have to pay per GB and it gets expensive…really fast. http://www.brainkeeper.com: I really liked as well. Biggest downside is that making the wiki public, or having a portion public is not possible. I need that for the support section of our wiki. Still researching this though. I am still considering trying out a few others, but wikispaces is just spendy for us, as we’re only going to have a limited number of users. Again, storage space is an issue with centraldesktop…get spendy quickly. Going to look into wetpaint…but security of the entire wiki seems that it might pose a problem. In short, the option in the SAAS arena for small businesses, with few users and reasonable storage space are few. Where is the one that offers 10GB of space (reasonable), a few users 3-5, and is competitively priced ($15-$20) a month? Any suggestions. Thanks for reviewing PBwiki. Our business offering includes the first three seats for free and seats after that at $8/user/mo. So five seats should be $16/mo for you and comes with 10GB, not 10MB. Email sales@pbwiki.com if you’re having any issues with getting set up and we’ll take care of you right away. Yes, installation of MindTouch Deki Wiki, when one does not use the VMware Certified image, was once difficult; however, MindTouch now provides RPMs for all major Linux distros, you can find these here: http://wiki.mindtouch.com/Official_MindTouch_Deki_Wiki_Installation_Guides . With the RPMS and the our install guides installation is a snap. As long as I’m commenting again, I’ll reiterate since this post was never updated: MindTouch Deki Wiki does support groups, both internal and external (LDAP/AD). Moreover, MindTouch Deki Wiki provides the most granular permissioning with 64bit user roles. This post is sadly off kilter in a couple key ways, so it invites controversy and it’s real value is probably missed. First, the title steers people wrong. This isn’t a review of “enterprise wikis” in the sense that your needs are quite different from those of most people seeking an enterprise wiki. Your needs are rather specific. Second, given that title, you ask for a smack upside the head with your first sentence. Though anyone who has a clue about software, knows statements that definitive are never true. So I guess you put people on notice to expect some spew. If you had a title that better expressed your conclusions, and started with a little about your use and requirements – this would be interesting to a lot of people. Instead of being a distracting, punching bag sort of post.